Improving website traffic when updating an older website. Rackliffe Lock & Safe was holding onto an old legacy website that was built many years ago. This old site was old, but it got a lot of traffic. The problem was it wasn't mobile friendly and although it got plenty of traffic, it wasn't getting a good conversion rate. Our goal was to not just maintain SEO ranking, but to surpass it and to increase conversion rates for people coming to the website. What were the critical keywords and how was the website ranking in a search? What keywords were being missed? Who was the competition and what were they doing differently? 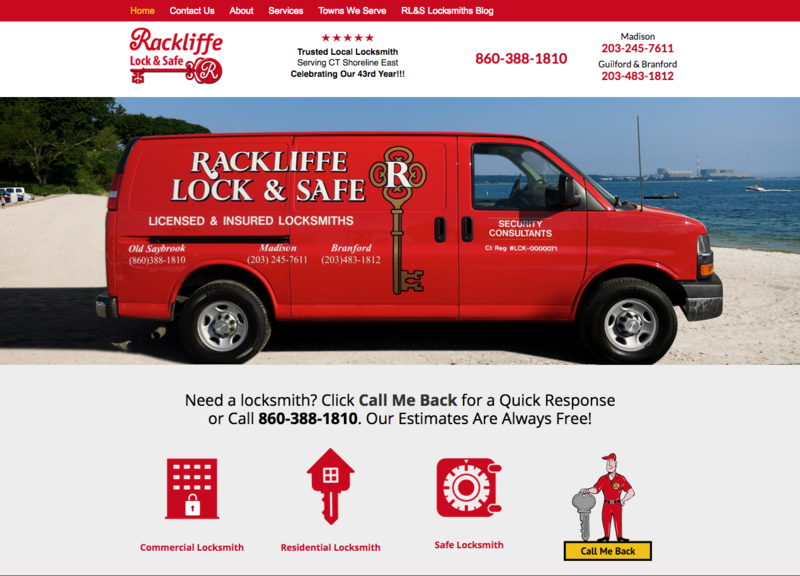 Updating the website identity including the logo and development of the Rackliffe Lock & Safe Character. Identify the key service areas and create landing pages with details of the services in each area. Developing a "Call Me Back" call to action to make it easy for customers to get help. Develop town landing pages to help business come up in a search. Put in place a tightly crafted organic search strategy that kept all of the existing SEO juice and add town by town unique landing pages for the areas of service. The site had a very successful launch. Within the first few hours a two new customer used the Call Me Back form. The website consistently ranks high in google and Call Me Back Responses come in daily.